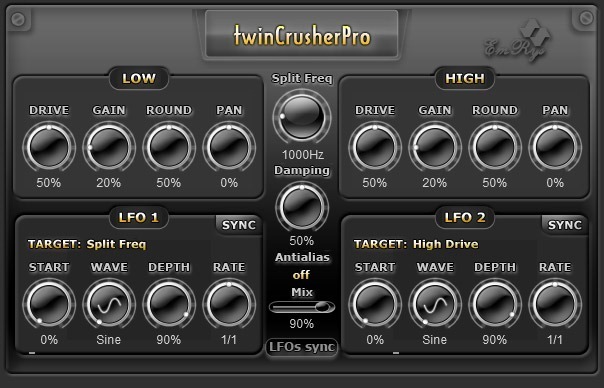 twinCrusherPro it's a two band distortion with overdrive algorithm and round (antialias) feature. Two LFOs to modulate all parameters. Very low resources taken! Your guitar, drums and leads will sound very cool! Round knob make sound smooth and round to avoid aliasing and reduce the peaks. On low values this knob insert nice harmonics. LFOs can to modulate all parameters. Nice presets for guitar, drums, lead, vibrato, tremolo, phased and many others.